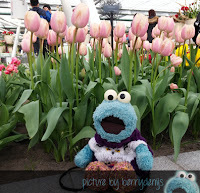 For who not know what Keukenhof is me will explain. 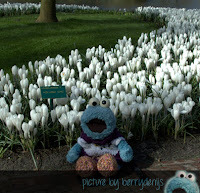 Keukenhof is a large estate with a very large garden. It very very large and huge. And there are all these spring flowers to enjoy for only 8 weeks. 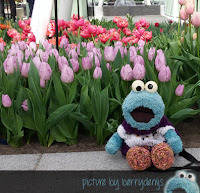 There were daffodils, crocuses in all different colours and… TULIPS. As far as me googly eyes could see in all shapes, sizes and colours. Especially at the Willem-Alexander Pavillion. Berry called it Tulip Heaven. And me totally agree. During the opening there were loads of festivities. These sweet ladies even framed me as a piece of art! You must know the theme of the flower park this year is Dutch Design, because the art style of the Dutch artists Mondriaan and Rietveld called ‘De Stijl’ is celebrating a birthday this year. Cool huh. 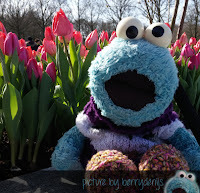 Me really loved it at Keukenhof! So many pretty flowers! The park is really beautiful and popular. Many tourists from all over the world come to see the flowers in bloom. Too bad it will close again after May 21st. 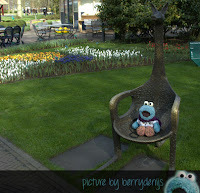 The best thing is, Berry went again and we will be going again too very soon! Me loves it. So me gonna tell you more about the park soon too hihi. 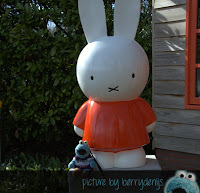 So bye bye for now and me will tell you soon about me second adventure at Keukenhof! I love flowers too but that place is a tiny bit too far away from me! Great pictures, thanks for sharing! Me so happy me can make you happy with me pictures! 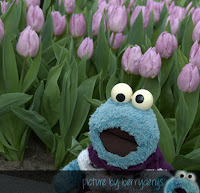 Stay tuned too, because me gonna wirte another blog about Keukenhof soon with even more pictures! I love this. I don't know much about blogs or how to do one. I don't usually go to them. But this is amazing. I must learn how on utube and do this also. ����. 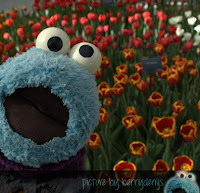 I love you Cookie. What a great place to visit. Why are they closing after May? Forever closed? or just for remainder of year? It only open for 8 weeks per year. After that the flowers are all done blossoming and the park closes until next year!